Posted under Health Guides. Updated 17 January 2019. Many people may think they are allergic to milk, but in reality, only 1-3% of infants are actually born with a milk allergy, and most outgrow it by the time they are teenagers. A milk allergy is sometimes confused with lactose intolerance, which is very different from an allergy and is much more common. When a person has a milk allergy, their body’s immune system has a bad reaction to one or more of the proteins found in cow’s milk. Casein and whey are the most common milk-proteins that lead to a milk allergy. 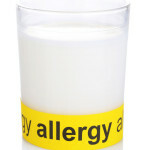 What are some of the symptoms caused by milk allergy? Can any of these symptoms be dangerous? The most serious reaction to milk allergy is called anaphylaxis (an-uh-fa-lak-sis). Anaphylaxis happens suddenly and involves dangerous changes to your breathing, heart rate, and other body functions. Anaphylaxis also occurse when several different symptoms occur together, such as getting a rash and wheezing, or stomach pain and swelling of the throat. Anaphylaxis usually happens within seconds to minutes of exposure to an allergen, such as milk, and is life-threatening without emergency medical treatment. If you or someone you know has ever had a serious allergic reaction after coming in contact with milk or a milk product, use the EpiPen® injector and call 911 right away! Because anaphylaxis can be unpredictable and potentially life-threatening, you must always carry your EpiPen® with you. Is milk allergy the same as lactose intolerance? No, milk allergy is different from lactose intolerance. Milk allergy is an allergic reaction to milk proteins, and lactose intolerance is the inability to digest the carbohydrate found in milk (lactose). The symptoms of lactose intolerance are usually diarrhea, cramping, and gas. If you have a milk allergy, do not consume lactose-free dairy products as they likely contain the milk protein you are allergic to. Who can be allergic to milk? A milk allergy can affect people of all races and ethnic groups. Most people develop milk allergy when they are infants and outgrow their allergy as they get older. A small number of people do not outgrow milk allergy and remain allergic to milk as adults. Milk allergy does not usually develop later in life. How can I tell if I am allergic to milk? What are your symptoms after eating or drinking foods that contain milk? How long does it take for you to get symptoms? Do you get symptoms every time you have a milk-containing food or drink? Do any of your relatives have a food allergy? What can I do if I have an allergy to milk? Plan ahead. Think about what you would do if you accidentally ate or drank a food that contained milk. Your health care provider can prescribe a drug called epinephrine that can stop the symptoms of an anaphylactic reaction and give you time to get to the hospital. You may have heard of an Epipen® which is the most commonly prescribed form of epinephrine. If you have severe reactions to milk, it is important for you to always carry an Epipen® or another form of epinephrine in case of emergency. You should ask your health care provider when and how to use your Epipen® and what you should do after you use it. Most of the time, you should call 911 and be seen in a hospital emergency room for observation to make sure that your reaction has stopped. What else should I do if I am allergic to milk? Talk to a nutritionist. A nutritionist can help you figure out which foods might have milk in them. They can also help you find milk-free substitutes that will give you important nutrients such as calcium, vitamin D, and protein. Be careful when you eat out. Tell your server that you are allergic to milk and always ask about the ingredients in a menu item before you order it. Bring your own food. If you are going to be a guest at someone’s house, bring your own food just in case you can’t eat what the host prepares because it contains milk. Read food labels and stay up-to-date with food products. Every now and then food manufacturers change their labels. Even if you eat a certain product all of the time, remember that the ingredients can change. Avoid product labels that have the letter D in bold type. The D stands for dairy. You will typically see this letter on Kosher certified products (foods that meet Jewish dietary laws), indicating that the product contains dairy. Also be careful when looking at foods with the Kosher Pareve designation, as there still may be traces of dairy from potential cross contamination, even if considered “dairy-free” by Jewish dietary laws. Purchase deli meats with caution.Cross-contamination can occur when meats are sliced on the same equipment used to slice cheese. Prepackaged deli meats such as salami can also contain milk proteins in the brines that surround the meat. Most food manufacturers list a 1-800 number on the back of their products that you can call to find more information. Check out the Nutrition Facts label. It is a requirement that the Nutrition Facts label on all packaged foods must list if a food contains a common allergen such as milk. You can also double check that a food is safe by reviewing the ingredient list on the food label. Remember that Non-Dairy does NOT always mean Milk Free. A company can use the term “non-dairy” on the product, even if the product contains milk protein. An example of these foods include creamers and frozen whipped toppings. If you see “non-dairy” on a package, still make sure to read the ingredient list on the back.